Working bees are held from 9 am to 11 am, usually on the third Sunday and second Thursday each month, except January. 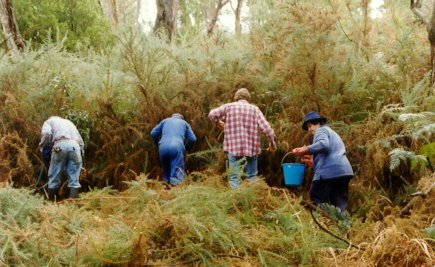 Bush care and weeding are frequent activities. The heavy jobs, including construction, are done by Council staff. The Friends do the lighter work of bush care, weeding and planting. The latest working bee calendar is at the end of this page. Everyone, experienced volunteers or novices, are invited to join our working bees at any time. 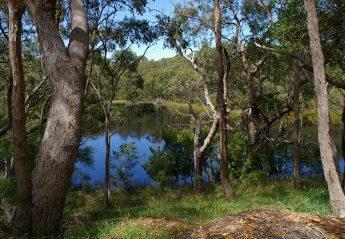 Inexperienced volunteers will receive assistance from experienced volunteers in identifying plants and carrying out minimal disturbance bushcare. Please let the working bee organiser, Bob or Jane, know when you plan to attend for the first time. They will ensure you are welcomed. Wear sensible protective clothing, boots and gloves. The Park has a variety of terrain, and can be wet underfoot. Many individuals also work at other times with Bushcare – either in small groups or on their own. A group meets regularly on the second Thursday of each month at 9am. Contact Jane Schoettgen on 8339 7245 if you would like to join her in this work. ensure that those working at Bushcare have appropriate workshop training in plant identification and Bushcare techniques. Look before you weed know where the native plants are. Choose the most effective and selective weeding technique for the plant and the location. Disturb soil as little as possible. Replace any disturbed soil, press it down and replace plant litter. Adapt to the season and weather conditions. Don’t pull or grub weeds when the soil is dry and roots break off when pulled, or tramp through when soil is so soft that your feet damage plants at each step. Minimise the amount of trampling over the site and scatter the team of workers so that they do not form a new trail. Wear soft soled shoes and clothes which do not carry weed seeds or drag on foliage. Wear gloves. Before you pull, grub or poison large weeds, pull the small weeds which are growing underneath them. Avoid damage to native plants. Don’t drop or fell large weeds onto native plants or drag boughs through the bush. Remove from the bush any parts of weeds which could regrow: ripe fruits, seed heads, bulbs, rhizomes and runners. Break up the rest into small pieces and leave them scattered to form a mulch, especially over the spots where weeds have been removed. Do follow up work before moving on to weed a new area. Remove weed seeds or bulbils which could scatter into the weeded zone. Where native plants are regenerating among dense weeds, clear them some growing space but do not create large openings.